Diverse, Liberal, Distrustful, In-debted, Most Educated, Optimistic? 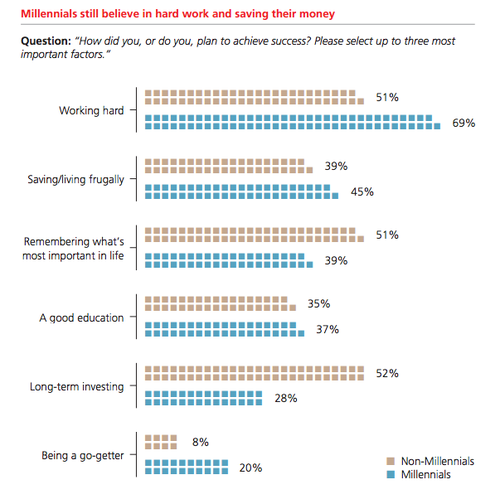 These are the most poignant results from the latest Pew Research study on millennials. 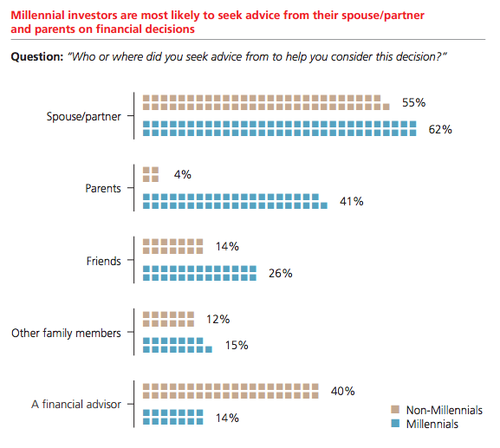 The study, entitled “Millennials in Adulthood”, was conducted this past February and revealed some interesting trends beyond the previous UBS report I mentioned in a previous post about the nature of Millennial investors. 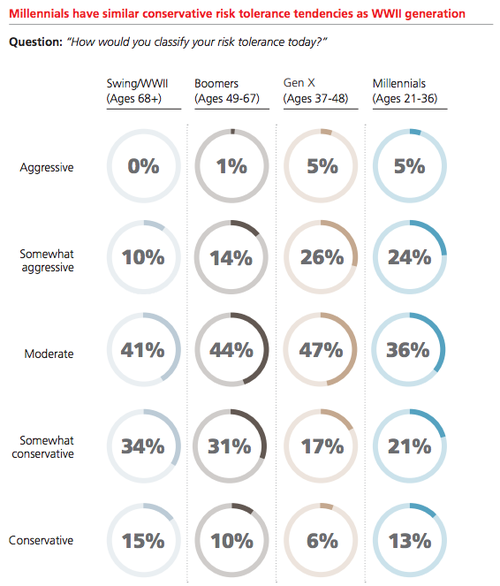 In the UBS report, Millennials were found to be as conservative financially as the Greatest Generation. I, and a host of others, attribute this to having witness to the effects of the Great Recession on both their parents and loved ones in older generations, as well as having become financially depressed since entering the workforce as the economy crashed or soon after. In addition, it must also be noted that this young generation is insanely in debt thanks to crushing student loans and rising costs of education. They are a generation that knows only the War on Terrorism; the oldest in the Millennial range was about 10 years old during the first Gulf War and 20 years old when 9/11 happened. This is also a generation that has only known the 24 Hour news cycle and of course, is often mentioned as the Internet Generation. The social experiences of these adults - what they’ve witnessed - can be described as a “hyper world” from Hypertext (HTML) to hyperbolic political divisions. In relation, this group of people also contains the largest segment of diagnosed ADHD - and apart from Extacy and MDMA, the main drug of choice for American Gen-Y’s in Adderall. Google replaces the need to memorize; Soylent replaces food; and Facebook replaces the rolodex, water-cooler, school reunions, and phone calls. But as all generations have experienced drastic societal, generational, and technological upheavals and disruptions which shaped their outlook and philosophies, Generation Y seems to have learned different lessons than those in previous groups at the same age. According to the Pew Study, 50% of Millennials consider themselves political independents and almost 30% are not affiliated with any religion - representing the highest rate of non-affiliation with institutional thinking in any recorded generation. The level of distrust felt toward government, corporations, political parties, and religions is completely understandable given all the events previously described. But even more telling is that less than 20% of Millennials think most people can be trusted; whereas previous generations seems a bit more socially trusting: 31% of Gen X, 37% Gen Silent and 40% of Boomers. According to the Pew Study authors, Gen Y’s social distrust could be explained, in part, by the groups increased racial diversity as compared to previous generations. As Gen Y is 43% non-white - a much higher percentage than preceding groups - Millennials are the most racially diverse group so far. (According to Census Bureau estimates, the US population will be majority non-white by 2043). Of course vulnerability and continual disenfranchisement spanning generations would in fact provide a basis for distrust, but I also think the advent of the 24 Hour news cycle and technology have exposed us all to a world full of institutional, economic, judicial, medical, and racial inequalities - globally. However, looking deeper into the notion of distrust of institutions and religious organizations, we see that Millennials are still very optimistic about the future and in particular about the potential of both government and business to meet today’s most pressing challenges. Given this new piece of the puzzle, coupled with the fact that Millennials are more financially conservative and not believing Social Security and Medicare will be viable when their time comes, we can postulate that Millennials are more distrustful of the status quo in terms of governance, businesses and religious divide. Millennials have come of age in an increasingly polarized political and religious world. Politically, this diversity, optimism and distrust of institutions and religions have benefited the Democratic Party. Though, generally, the white majority is a bit more conservative than the non-white, the Millennial white is considered much more liberal than older whites. However, as studies have shown, Millennials are mostly fiscally conservative and socially liberal. I don’t think either party can rely on as strong a loyal base with Millennials as they did with Gen X, Silents, or Boomers. Instead, I do think there will be room for more independent, 3rd party candidates as well as less room for “cookie cutter” candidates in either party. There could be more room for independently voting and thinking Democrats and Republicans. Over the past few years, the Republican Party has gone more to the right - alienating millennials, minorities, and the not-so-affluent. These events have made the Democratic Party a place of uncertain refuge for Gen Y. With Millennials gravitating toward major cities, and years of Republican gerrymandering, the political landscape of the US is going to be pretty interesting. In the recent NPR article: "Why Millennials Are Avoiding Small-Town America", Dupre writes about the demise of the American small town as young people flee from Smallville toward Metropolis, taking with them education and economic opportunity. But they are also taking their progressive values and social activism. The article puts the onus on small town planners for attracting businesses to commercial parks with heavy tax breaks and not focusing on town centers and residential plans where young professionals can feel more able to exchange ideas and cultures. But ultimately, young people are passing on lower living costs and opting for much more expensive real estate as just a cost of opportunity and progress. There isn’t much in this article that shows a huge difference between other generations who have moved to more populated areas for a better life - but I think it adds another dimension to the Pew study. With regard to Gen Y’s outlook on Business and Government, Deloitte released their Millennial Survey 2014 recently. Covering a small survey sample of young professonial Millennials from 26 countries, the survey set out to understand how business can better engage this generation as both customers and employees. The Survey found that Millennials held four top priorities to be addressed in their lifetime. In order to tackle these issues, the survey revealed that, Millennials believed in the potential of Business and Government to do good. In fact about 50% of respondents believed in working for a firm with high ethical standards. It is widely documented that Millennials are highly discerning when it comes to working for certain companies, choosing ethics and responsibility over compensation. But this survey also highlighted that companies must also provide better avenues for leadership development and innovation. The majority believed that parochial thinking in management was the biggest inhibitor for innovation and advancement. As the quote highlights, the initial campaigns for CSR seemed to only be “blue” or “green washing”. As society becomes better at measuring performance and collecting socio-economic data, CSR campaigns will need to be more effective. At the same time, these survey respondents had a negative outlook of Government, but still had an optimistic outlook on what Government could achieve if we moved past the status quo. they are more empowered than any previous generation that had to fight for “civil rights, women’s rights, anti-war, and counter-cultural movements” of the 1960’s and 70’s. Though, they live in a society that hasn’t had to share in the sacrifice of war as the Great Generation or folks during the Vietnam, their world is just as turbulent and dangerous. Yet, their biggest issues don’t place terrorism highly, instead issues that will plague the whole planet take center stage: Climate Change, Resource Scarcity, Inequality, and Unemployment. So essentially the world can meet its challenges through economics and science mainly. But given sociological factors, they would also choose reason and moderation over dogma and divisive politics. One of the concerns I’ve had about all this attention and study of the Millennial generation is that we don’t hear much about young professionals around the world. 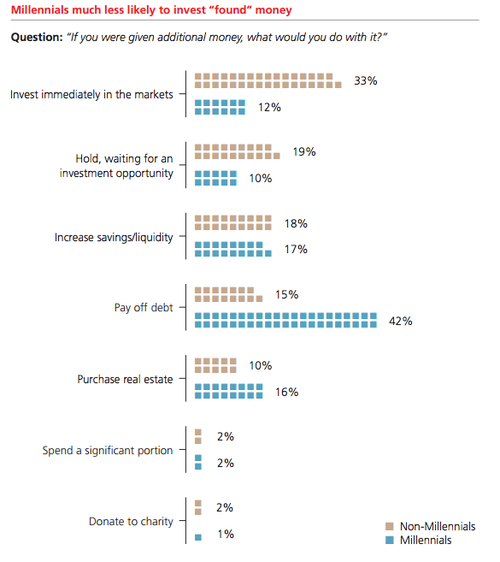 Most of the surveys, excluding the brief Deloitte one, all speak about the American Millennial. We need to know more about young adults in each country and that research is hard to come by. It also requires quite a bit of cultural context. If you have any ideas or came across any interesting material about Global Millennials, please reach out, I’d love the extra research before my next post. Bear with me as this is my first ever real blog post. Usually, I just submit a link to an article or quote with a few words on my FB wall; but this year, at the request of many of my close friends, I will try to expound on thoughts, themes, and trends I’ve been noticing over the past few years. One topic that has been coming up on the web is about Millennials and their view of the future. 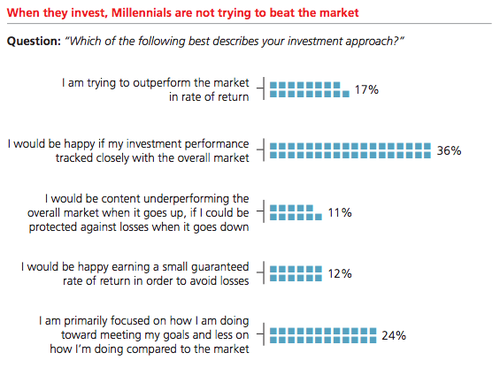 UBS Wealth Management released a report this quarter about how Millennials view investing, finances, and success. Though much has been written by bloggers and pundits about what this mysterious generation thinks, wants, or does - the common theme in terms of investing and prospects for the future can be summed up as: “wary” or “conservative”. This generation, currently between the ages of 21-36, has weathered an major financial crisis as they have entered the workforce. They’ve either seen offers rescinded, depressed wages, or had to witness their parents’ financial difficulties. The Millennial generation is also a generation that were in their teens when the war on terror began on 9/11/2001. 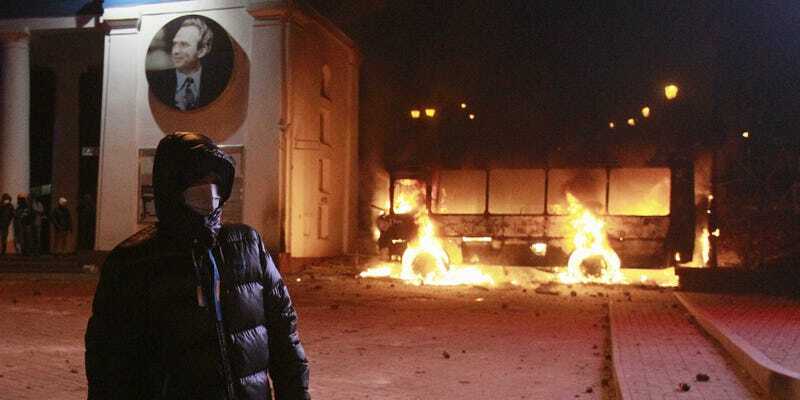 So for a large part of their early adulthood, they’ve experienced a world so volatile and dangerous that is has shaped a much different view of the future than previous generations at their age. Though the Baby Boomers and WWII generation (aka The Greatest Generation), experienced immense societal upheaval and discord; it is the Millennial generation that has been through relatively difficult events in an era of rapid technological development and adoption. Millennials are definitely standing on the shoulders of previous generations, but as they do and with more information at their fingertips their views on life, success, and wealth are quite different. This increase in Cash and decrease in Stocks, correlates with some other research I’ve come across about the nature of individual investors post-Great Recession. The fact is that though the markets have been soaring in the past few years since the Crash, the number of individual participants has remained low. Valuations have been up, but unemployment still is weighing on growth (Q4 2013 GDP Figures just came in at 3.2% and 1.9% for all of 2013). Another reason is that Millennials are extremely distrusting of corporations since the Crisis revealed so many shady and unethical practices by major banks and corporations. This is a generation that will not choose to work for an employer based on their social impact and policies. Their financials ambitions with the market and investing have been tempered and made more realistic. 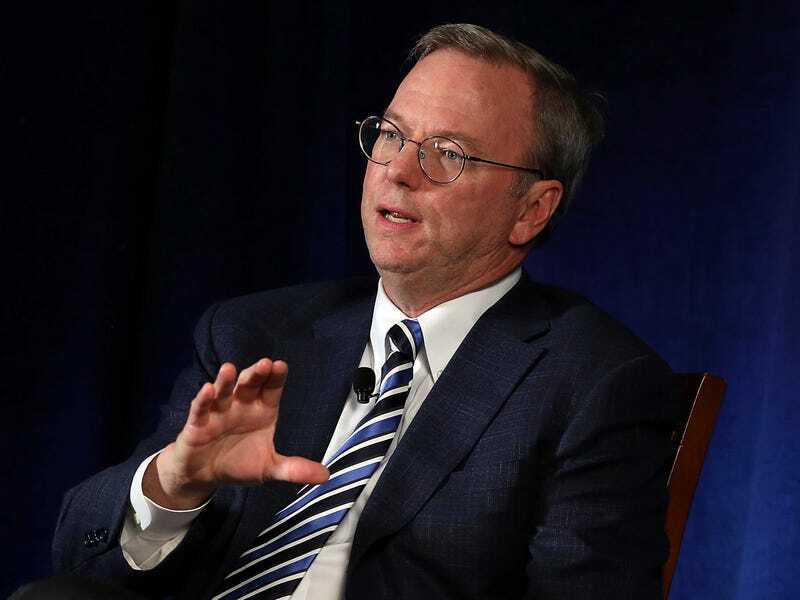 And their distrust of 3rd Party advisors is apparent. They prefer advice from trusted recommenders. As the probably the most indebted generation, the answer to this survey question is no surprise. And because they’ve seen many people’s life-savings and 401K’s decimated, they know they have to put in the time and effort to be successful. Recently, I read that this is also one of the most frugal generations - I’m sure that is debatable, but I can see merits of that argument given the answers to the next question about Definition of Success. It seems all the events from the 90’s to now, witnessed by Millennials, has made them ambitious, but shaped their worldly pursuits to be less materialistic and more experiential and intangible. 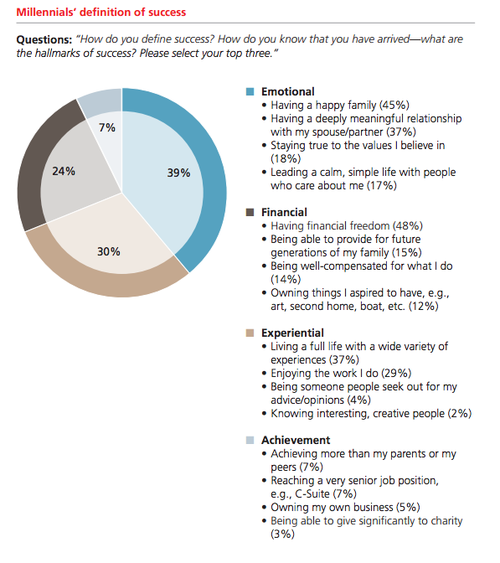 Emotional Well-Being tops the list, followed by Experiential pursuits, with Financial success coming in a significant 3rd. This all makes sense. 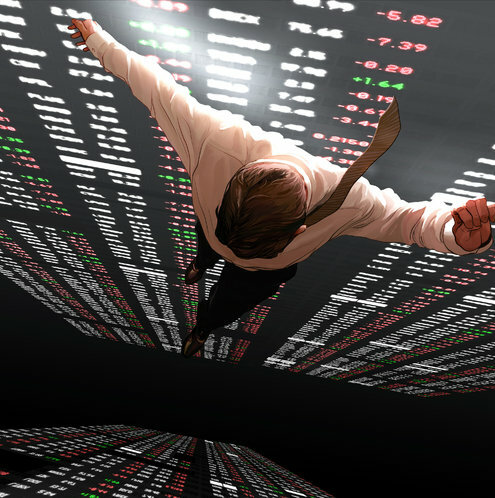 There certainly are those that want to pursue a Gordon Gekko life-style, but ultimately, as we are speaking in vague terms of generations, these Millennials seem to need financial wealth only to live a full life. When asked what income is considered successful, Millennials averaged $220K, which was pretty close to each of the other generations which ranged from $205K to $256K. It is unclear if this was inflation adjusted, but let’s assume so. When asked what income would make them notably happier, all other generations came in at around USD $2M, while Millennials overwhelmingly (80%) stated USD $1M. Given their conservatism as highlighted in the UBS charts, these figures about well-being and wealth definitely suggest that Millennials are driven by the quality of their assets as opposed to their quantity. In addition, they are redefining what assets mean to them to include happiness factors such as a good home, strong relationships, and trying out different paths. This last part is evident at any Millennial resume you read - it’s unlikely folks in this generation will keep a job for more than two years. 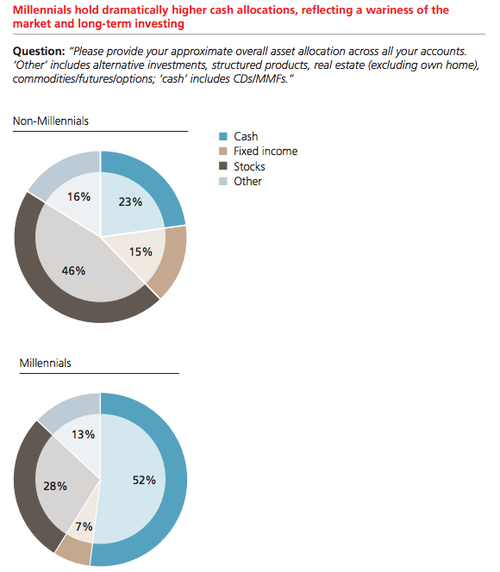 I happen to be at the cusp of the Millennial generation, so some of UBS’ finds don’t surprise me at all. And while I can’t speak for my whole generation, I can say that I’m excited to see how we will impact our world. Of course, much of the Millennial reports and surveys mostly target the US population, but from all my travels, I’ve seen many of these trends translate well in other cultures. In emerging markets like India and China, where choice in educational path, growing middle classes, and increased access to information, have all brought similar opportunities and social shifts. I’ve also seen a more tolerate and activist generation across Eastern Europe, the Middle East and Africa, where I had the opportunity to serve in United Nations Peacekeeping Missions. Let’s see what happens with this generation. Fossil fuels are key to the future. Here is, probably, the main thing worth remembering about the launch of the Macintosh: The soundtrack Apple chose for the moment of the machine’s introduction was, hilariously, the theme song from Chariots of Fire. That grin on Steve Jobs’ face. You can tell when he’s pleased with himself. Happy birthday Mac. Hollywood and the Religious Right? Browse through imdb and you’ll find another movie about Jesus, a movie on Noah, another movie about Moses, and a film about heaven being real. Oh, and 4 Kevin Costner movies. Not to mention two movies last year about the Whitehouse being overtaken. I sense a theme. Funny if they all opened on Election Day all over the south and key battleground states.